A raffle is a source of gambling in which every individual who takes part in the raffle has a chance to win a prize. In the raffle, a ticket is given out to every individual and a copy is kept. In the end, the ticket is drawn out from a box or a bowl and the winner is announced. It depends purely on luck that whether or not your name or your ticket will be the chosen one. Usually, a raffle takes place in a promotional event or a carnival whereupon paying some money, you get a ticket. 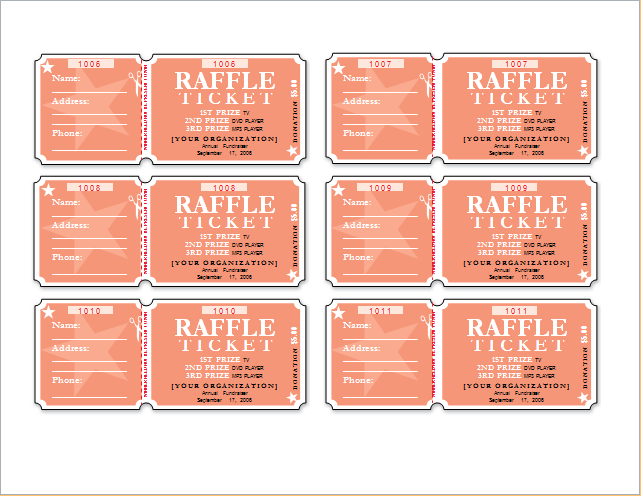 When designing a raffle ticket for an event, make sure that this ticket is small and has a serial number written on it to make it easier to announce the winner and to keep track of all the raffle tickets. If the ticket will be sold, then the amount of money it was worth should also be mentioned on the ticket. The terms and conditions can be mentioned at the back of the ticket. If you are planning on printing the terms and conditions then make sure that the size of the ticket is a bit big. The colors should also be kept in mind. If the raffle ticket is being sold at a carnival then fun colors should be used. If the event is happening at an organization’s event then the ticket can be made in the colors of the organization. The font used should be bold and the serial number should be clearly mentioned as well.